Sift the flour, wheat bran, wheat germ, and salt. Add the cocoa powder, almond meal, sugar and baking soda. Using a spatula, blend in the water, vinegar, vanilla essence, and oil. Mix well to make a smooth thick batter. Spoon into the muffin pan. Top each muffin with an almond. Bake in a pre-heated oven at 400F for 15-20 minutes or until a toothpick inserted in the centre comes out clean. Remove the muffins from the pan. Cool on a wire rack. 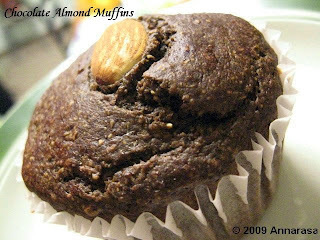 This recipe will yield 6 medium-sized muffins with a somewhat soft and grainy texture and a beautiful chocolate-almond flavour!! 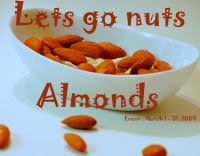 These muffins go out to JZ @ Tasty Treats who is hosting Lets Go Nuts... Almonds. It also goes out to Pallavi @ All Things Yummy. She is hosting Sunday Snacks - Grab n Go. Love chocolate..This looks so yummy and perfect.. The best way to inaugrate them was definitely with chocolate! And healthy too. Looks lovely. Looks yummy.. and I like the whole grain goodness in it.. Thanks for the entry.. ! Thanks for sending this to my event..
You have a wonderful food blog! I truly loved your recipes including this Chocolate muffins recipe.